Acknowledgements to K1JT Joe Taylor and WSJT Development Group. The algorithms, source code, look-and-feel of WSJT-X and related programs, and protocol specifications for the modes FSK441, FT8, JT4, JT6M, JT9, JT65, JTMS, QRA64, ISCAT, MSK144, are Copyright © 2001-2017 by one or more of the following authors: Joseph Taylor, K1JT; Bill Somerville, G4WJS; Steven Franke, K9AN; Nico Palermo, IV3NWV; Greg Beam, KI7MT; Michael Black, W9MDB; Edson Pereira, PY2SDR; Philip Karn, KA9Q; and other members of the WSJT Development Group. The program was borrowed from the open source software K1JT. Only decoders and generators were used from K1JT – WSJT and were rewritten to C ++. Almost the same location of controls was used for easy operation. The software is fully compatible with the modes in WSJT software. The visual interface is QT4.6.8. All required libraries are compiled statically and are embedded in the body of the software. Additional libraries are not necessary. All settings and configurations happen immediately and do not need to be restarted, for example changing the sound settings or rig control. MSK144 For meteor scatter. Message frame duration is 72 ms and with Sh option 20 ms. Character transmission rate for standard messages is as high as 250 cps. FSK315 For meteor scatter. Character transmission rate 105 cps. FT8 Designed for fast tropospheric QSOs. JT65 VHF/UHF For EME and troposcatter. PI4 PharusIgnis4 A digital modulation (MGM) for beacon purposes. SSB transceiver and antenna for one or more VHF/UHF/SHF bands. Computer running the Microsoft Windows Xp, Windows 7 32 or 64 Bit. For Linux QT4.8.6 and Alsa librarys. 1 GHz or faster CPU and 128 MB of available RAM. The monitor with minimum resolution 1024×768 or for notebooks 1366×768 (more is better). Computer-to-radio interface using a serial port for T/R switching, or VOX control. Audio input and output devices supported by the operating system (Sound card full duplex). Audio or equivalent USB connections between transceiver and computer. A means for synchronizing the computer clock to UTC within ±1 s.
No need for special installation, just extract the archive file with its containing folder wherever you want in the PC. Recommended place is a non Operating System drive, for example if OS is in C:\ extract into the D:\MSHV_XXX . Starting software from the *.exe file or create a shortcut on the desktop. Do not copy .exe file to desktop. If you have an old version of software, please delete the existing shortcut on the desktop if there is one. Extract the archive file with its containing folder and then create a new shortcut on the desktop. If you no longer need the old version you can delete it. Corrected: Period time error, if switching application between modes (error in ver.1.61). Added: Two communication ports, one for CAT, other for PTT if needed. Added: Some changes in to working logic for CAT functions, ideas from R1AY Sergei. 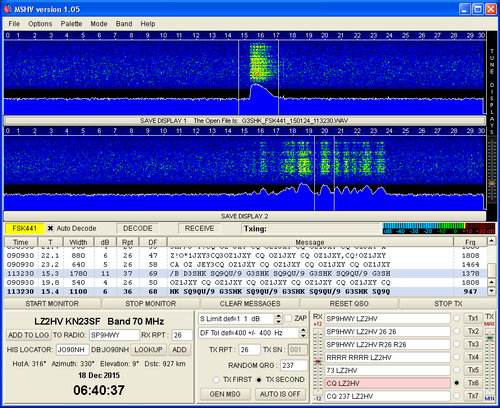 Removed: AP Decoding from JT65 modes. Removed: Decode levels from JT65 modes.